Klinger plays disc jokey on the PA system; a new nurse is hazed; and Mulcahy has to contend with one patient who won’t stop talking and another who won’t stop. Klinger becomes a lunch-hour disc jockey on the hospital’s public address system. While watching “Little Broadcast of ’53,” it was impossible not to think of the M*A*S*H episode “Your Hit Parade” from Season 6. Radar played disc jockey to liven things up during a lull in the fighting, then continued during a deluge to keep up morale. In this episode, Klinger is spinning the vinyl because–well, to be honest, it’s never explained why Klinger is spinning the vinyl. Potter tells Mike D’Angelo that Klinger is playing music to keep up morale. But why is morale low? Klinger later tells Father Mulcahy he wanted to cheer patients up a little. It’s hard to believe Alma Cox would allow anyone to play music in the hospital, let alone her sworn enemy Klinger. “Little Broadcast of ’53” features a number of storylines. There’s Mellow Max Klinger and his lunchtime radio show, Father Mulcahy dealing with two difficult patients, and a new nurse learning the ropes at General General. Father Mulcahy loses his cool. For once, Father Mulcahy has the meatiest role. An annoying patient follows him around, constantly wanting to talk, interrupting Father Mulcahy while he’s counseling another patient and later while he’s praying in the hospital chapel. Father Mulcahy finally blows up at him, telling him to go live life rather than just talk about it. Both Potter and Father Mulcahy try to help another patient, one who refuses to talk. In the end, it’s Klinger and his music who help the patient start to come out of his shell. The third storyline involves two patients hazing a new nurse named Judy Canfield. At one point, the trick her into thinking one of them drank his own urine sample. She considers quitting but Potter talks her out of it by sharing his own experience with hazing. Dr. Pfeiffer steals Judy’s lunch all week, too poor to buy his own food. Alice Cadogan as Nurse Judy Canfield. I enjoyed this episode, probably because Alma Cox isn’t in it and Mike D’Angelo only shows up for a few seconds. The new nurse storyline is the strongest, in my opinion. Klinger’s disc jockey act is weak. It’s nice to see Father Mulcahy have a solid storyline. I don’t think all three main characters shared a single scene, however, which is always disappointing. Alma Cox, Mildred Potter, and Soon-Lee don’t appear in this episode. The episode takes place over the course of an entire work week, starting on Monday, October 5th and ending on Friday, October 9th. The General General “radio station” uses the call sign KMAX. The episode ends with the following acknowledgment: “Our Grateful Thanks to The Veterans Bedside Network.” The Veteran’s Bedside Network is a non-profit dedicated to helping hospitalized veterans produce their own radio and TV programs. 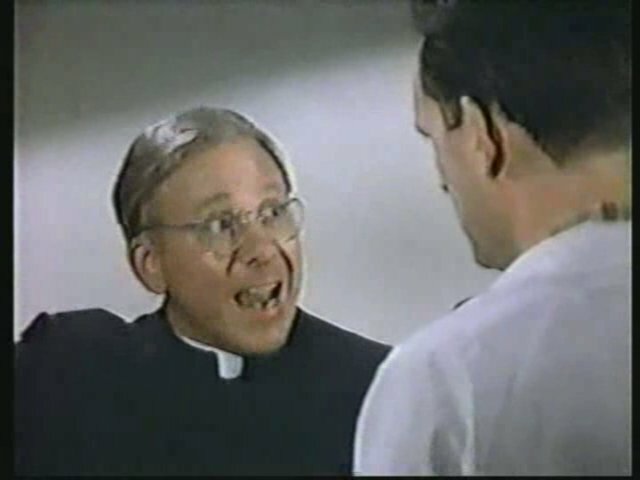 It’s vague, but Father Mulcahy mentions being in Korea while talking with a patient who was also in Korea. During one of his radio shows, Klinger talks about the simple days before Korea, when bacon woke you instead of incoming mortars. 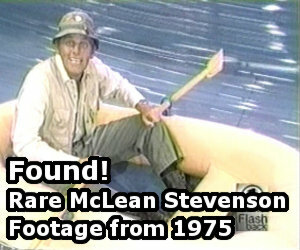 This is the third of 13episodes directed by Burt Metcalfe. This is the second of 12 episodes written or co-written by Dennis Koenig. Guest star Tom Kindle made two guest appearances on M*A*S*H: in “Blood Brothers” (Season 9) and “That Darn Kid” (Season 10). This was one of a couple of early times that “AfterMASH” continued its predecessor’s practice of a timeline that didn’t make any sense. In this case, the episode is stated as having started on October 5. Yet, Potter’s letter that starts off the first episode is dated as Sept. 26 — and the rest of that initial hour includes enough time for Klinger to receive the letter after it’s mailed, for the Klingers to move to Missouri, for Mulcahy to also move to Missouri, and for Mulcahy to have ear surgery. 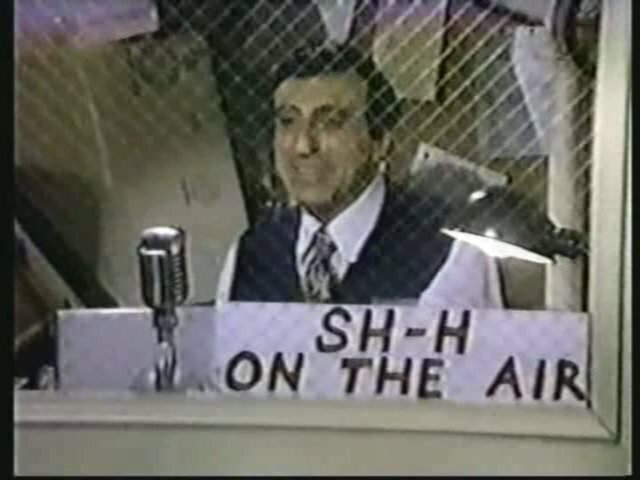 Plus, another half dozen episodes occur before this one involving Klinger’s use of the hospital’s speaker system to serve as a “radio” station. I’ve always felt that radio was something that Klinger could have made a career out of. The TV Guide summery makes it sound like this AfterMASH is a combo of “Your Hit Parade” and the MASH episode with CE3 and BJ trying to keep the one wounded soldier from selling securities to the other patients.